It’s September, and I can’t wait for FALL! I can hardly wait for cooler temperatures and to break out the fall sweaters. It’s also time to start thinking soup and chili! This Brown Sugar Cornbread is the perfect addition. to a hot cup of soup or thick bowl of chili! It’s simple to make and the dark brown sugar gives it a hearty fall flavor! Preheat oven to 350 degrees. utter an 8×8 in loaf pan and set aside. In a large bowl, whisk together the yellow cornmeal, flour, baking powder, and salt. Heat the butter and brown sugar in a small saucepan over medium-low heat just until melted, and whisk until mixture is smooth. Remove from heat; whisk in the milk and then the eggs. Pour into the dry mixture, stirring just until blended. Pour the mixture into prepared pan. Bake until the bread is golden and a cake tester inserted in the centers comes out clean, about 20-25 minutes. Serve warm or at room temperature. Be sure to follow our Pinterest Board for Yummy Soups and Stews! 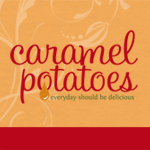 Follow caramel’s board soups, stews, chilis on Pinterest. I think I’ll give this a go tomorrow & pair it with pulled BBQ pork & cole slaw. I melt the butter in a cast iron 8″ pan then add the brown sugar then whisk the milk and egg and pour into the dry ingredients then all goes back into the cast iron pan to bake for about 22 mins. It gets crispy on the outside and is so good!